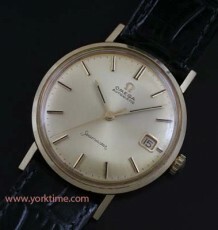 Omega manual wind watch from 1956. Solid stainless steel case with bombe lugs and the same movement as used in the Omega Ranchero and Railmaster. 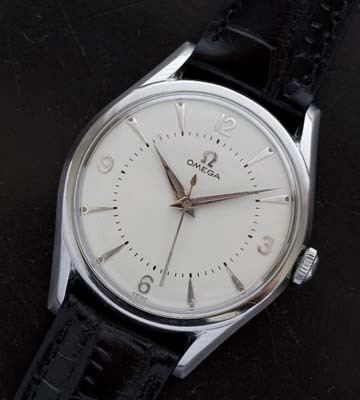 This stunning vintage Omega watch features a very dramatic and stylish all steel case with sloping bombe lugs. The larger than usual case, this model is similar to the larger manual wind Seamaster watches I have come across. The snap back caseback features an integrated rubber gasket similar to the Omega Ranchero’s made in the late 1950’s which also used the famed calibre 284 movement. This back is also stamped Waterproof like the Ranchero. The Omega calibre 284 movement is one of the best known models that was based on the wartime 30T2 movement. The cal 284 was used in Seamaster watches as well as the Ranchero and Railmaster models produced in the late 1950’s thorough to the 1960’s. 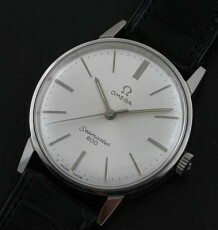 This model is also adjusted to 2 positions, which is a very rare designation in Omega movements. 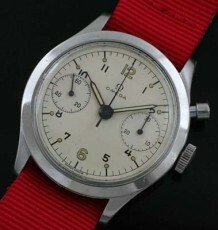 The serial number of the movement dates the watch to 1956. The professionally restored dial features steel Arabic numerals at the 3, 6, 9 and 12 positions and uses thin arrowheads markers at the remaining spots. The watch is also fitted with large steel dauphine hands. 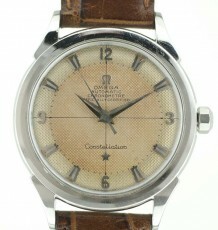 Overall this is a terrific vintage watch and will certainly provide tons of wrist presence for years to come. The case measures 36 mm wide by 44 mm long and can be supplied on either a black or brown leather strap.